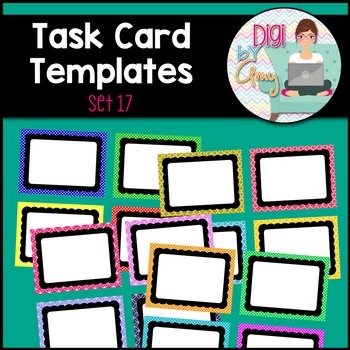 You will receive 15 task card templates. There are four frames per 8.5 X 11 page. Files are provided in .png images only (so they have a clear background) and 300 dpi. The cut lines are a separate png file. Just layer the two right on top of each other. 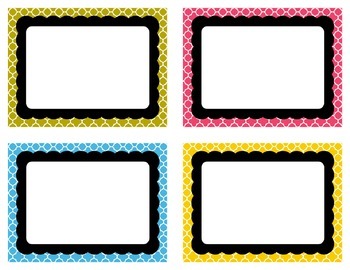 These task card temples come with a large black scalloped frame and a polka dot, quatrefoil or double wedding band background paper (5 of each). Each "card" on the template has a different color background. 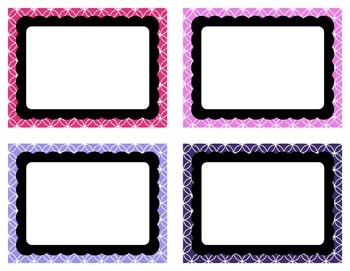 Check out the preview to see images of all the task card templates in this set. No more trying to re-size 8.5 X 11 frames that you have already purchased and have them look funny because you have tried to make them the right size. 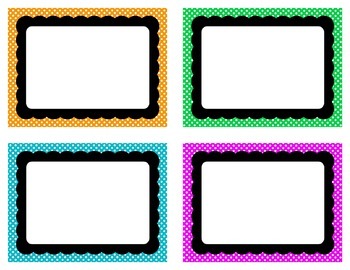 These frames were all made to be 5.5 X 4.25, the perfect size for task cards. All you have to do is add your text.